When I used to go into an office, I would hear this all the time. My coworkers, who are analysts and investors like me, were talking about silver. It’s easy to see why. The metal has basically gone straight down from 2011–2015. No one wanted anything to do with it. It had a short-lived rally in early 2016, when it gained nearly 50%. See why some are calling this the "most effective moneymaking technique" they’ve ever seen. Click here to see it explained. Will silver break down or break out to the upside? I’m taking the over. And I’m not the only one who thinks silver’s poised for a huge rally. Keep in mind, silver topped out at $20 in 2016. In other words, Bloomberg’s brain trust is saying that silver could spike more than 20% from here. That’s a huge move. But even that’s understating silver’s potential. As you’re about to see, silver could rise 10x in the coming years. But all the signs are pointing to a truly explosive silver rally. I’ll spill the details in a second. But you’ve got to understand something about silver first. It’s a special commodity. Yes, it’s an industrial metal that goes into everything from solar panels to batteries. But it’s also like gold. The word silver literally means “money” in more than a dozen languages. This is important because silver hasn’t rallied like many other metals. In fact, it’s down 9% over the past year. Copper, the world’s most important industrial, is up 16% over the same period. It’s also lagged well behind gold, which has risen 6% over the past 12 months. Long story short: Silver’s been left in the dust. One of the most popular is that the silver market’s rigged. But I didn’t write this essay to argue that. However, I will say this: The silver market is probably one of the most concentrated markets on the planet. It’s dominated by a handful of players. And right now, the biggest player in the game is stockpiling silver like no one’s ever done before. We want to send you a copy of Crypto Revolution: Bitcoin, Cryptocurrency and the Future of Money 100% FREE today. Whether you’re an enthusiast or the biggest crypto skeptic, you’ll gain a complete understanding of the crypto economy. Just click here for full details. JPMorgan is one of the world’s largest, most powerful, and most well-connected banks. It manages trillions of dollars. So it pays to watch what it’s doing. And last week, the giant bank received 597,000 ounces of silver. That’s about $10 million worth. After that giant purchase, JPMorgan now has 140 million ounces of silver sitting in its COMEX warehouse. That’s 54% of the silver supply monitored by the CME Group. That’s a huge deal. But you also need to realize something. That means it built this massive silver hoard in just eight years. But why? Well, I can’t say for certain. Only the top brass at JPMorgan knows the answer. But it could be because the U.S. stock market is looking weaker by the day. Or maybe the bank is worried about taking heavy losses during the financial crisis. And why wouldn’t they be? After all, the Bank for International Settlements (BIS) just named JPMorgan one of the riskiest major banks on the planet. In any case, I do know one thing: JPMorgan isn’t loading up on silver because it expects the price of silver to fall. That alone is reason to be bullish on silver. But it’s not the only reason. This chart compares the price of silver with the price of gold. 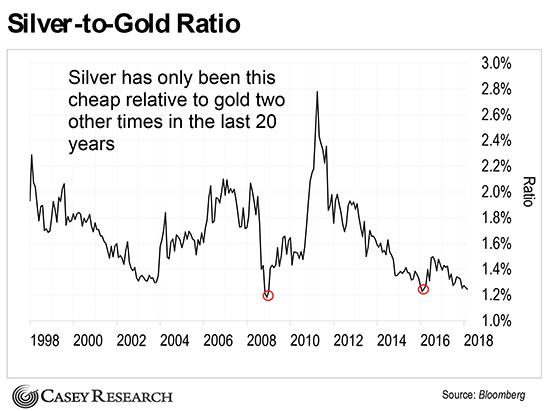 When this ratio is rising, it means that silver’s getting more expensive relative to gold. 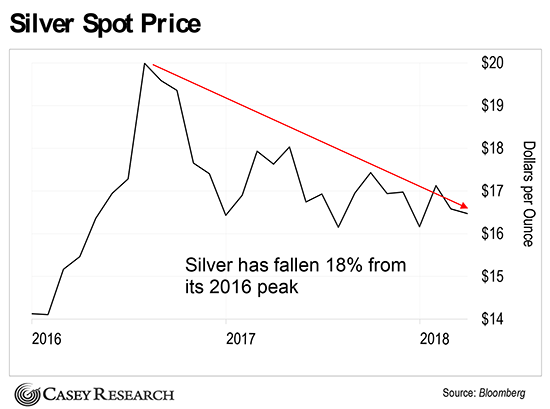 When it’s falling, it means silver’s getting cheaper relative to gold. As you can see, silver’s only been this cheap two other times in the last 20 years. The last time was in early 2016. Silver then went on to rally roughly 50% over the next seven months. The time before that was in late 2008. That time, the price of silver shot up 333% in just over two years. But the fact that JPMorgan is quietly loading up on silver tells me that something big is about to happen in the silver market. Of course, the average investor has no clue this is going on. If they did, silver wouldn’t be trading sideways. It would be skyrocketing. So, consider buying physical silver before the next buying frenzy begins in earnest. You can learn more about the best ways to own physical silver—and how to store it—in our free report here. You may also want to consider investing in silver miners. These companies are leveraged to the price of silver. In other words, the price of silver doesn’t have to move much for them to soar. Just understand that mining stocks are risky, so treat them like speculations. Only invest money you can afford to lose. Use stop losses. And take profits when you can get them. How high do you think silver can go from here? Are you going to take our advice and buy physical silver or silver miners today? Let us know here. 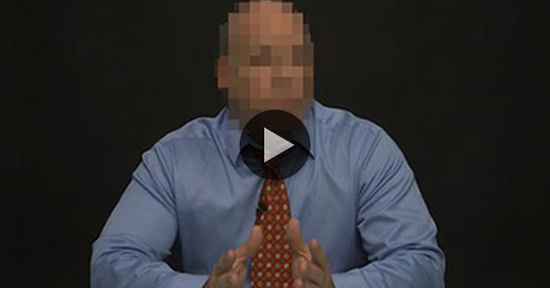 Almost NO ONE knows this millionaire’s moneymaking method exists. It’s a secret so lucrative, it drew the attention of 12 of the world’s biggest financial institutions and CNBC.